DC’s über-campy Batman ‘66 series is at its strongest when the Adam West-inspired Dark Knight and his Burt Ward Boy Wonder team up with other heroes from the silver and bronze ages of comics, like Wonder Woman and the Green Hornet. In this week’s crossover, though, the dynamic duo have an encounter with the Legion of Super-Heroes, a team of teens from the future, and things... don’t exactly go well. Batman and Robin’s father-son-like relationship has always been one of the more prominent elements of their dynamic. Robin looks up to Bats as a role model and Batman, more often than not, sees Robin as an immature youngster full of potential and in sore need of his wisdom and guidance. In Batman ‘66 Meets The Legion of Super-Heroes, though, the tables are somewhat turned when the titular Legion travels into the past in order to find and recruit Robin into their ranks. While the Legion’s more than familiar with Batman’s legendary escapades, they’re far more interested in convincing Robin to join them and help find Universo, a villainous hypnotist from the year 2966 who’s hiding somewhere in ‘66 Gotham. The idea that the Legion would journey through time to ask Robin for help rather than him utterly perplexes Batman, but before he can voice his concerns, both teams learn that 1966's Egghead has stolen the Legion’s time bubbles and escaped into the future. Using the sort of logic that you’d expect from a comic book television show from the ‘60s, Batman and Robin and the Legion of Super-Heroes decide to combine teams and split up in order to track the two supervillains in their newfound times. Batman leads Brainiac 5, Shadow Lass, and Ferro Lad to 2966, while Robin and the rest of the Legion fly off to find Egghead. As the respective teams of heroes settle into their missions, everyone begins to learn something about the preconceived ideas they had about one another that, ultimately, end up holding them back somewhat. Were this a more contemporary story, you might have expected Batman to consider that perhaps he’s too smothering and strict with Robin and that he should trust him a bit more to make decisions on his own. Instead, Batman ‘66 Meets The Legion of Super-Heroes falls into a very “father knows best” kind of moralizing that would have fit in perfectly with the television show it’s based on. 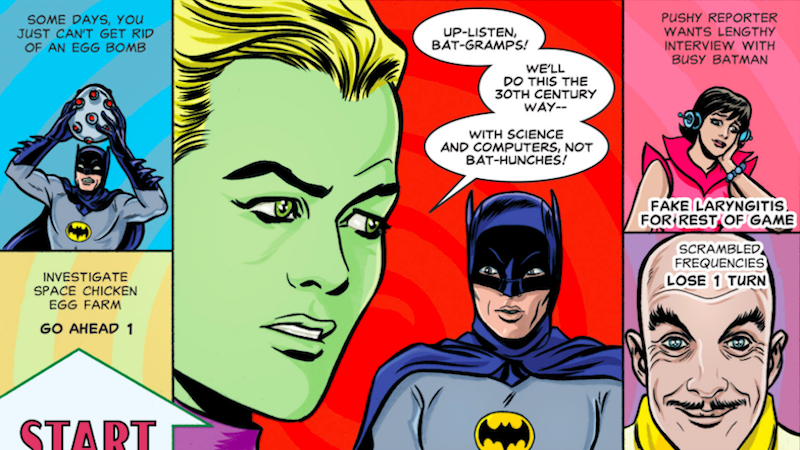 In 1966, Robin turns out not to be well-suited for the high-tech gadgets the Legion’s brought from the future—and in 2966, Batman gives Braniac 5 his comeuppance for relying too much on computers and not enough on old-fashioned Bat-instincts. Like all good camp, Batman ‘66 Meets The Legion of Super-Heroes ends on a cheesy cliffhanger that you just know will be resolved in an issue or two. The arc will probably wrap up with a loving (if stern) bit of advice from Batman about how teenagers should respect their elders, and the Legion will let Robin know their their offer still stands. It’s a familiar adventure with relatively low stakes, but it’s the kind of silly, lighthearted story that made the original run of Batman ‘66 such a fun read—and it’s what makes these team-up specials so refreshing.